The first apartment they looked at was in Dongsishitao. While it was spacious, it was too old and a 15-minute walk from the nearest subway station. "It also smelled of the last tenant," Song says. Luckily, the second apartment turned out to be just what they were looking for. Located on Nanzhugan Hutong, the apartment was 80 sq m in a building that was only 4 years old. It was a two-bedroom apartment, but Walters could use the living room on weekends. Only one person had lived there before and the furniture and appliances were new. There were even two balconies - one for each bedroom. The apartment was also conveniently located five minutes from the Chaoyangmen subway stop. Anxious over rising rents in Beijing, especially with the Olympics around the corner, the trio signed a two-year lease. According to a January report by the National Development and Reform Commission (NDRC), rents in China have risen 3.1 percent year on year. Housing prices in China overall rose sharply by 10.2 percent, putting pressure on landlords to raise rents across the board. The rent on the Nanzhuguan Hutong apartment was originally listed as 3,600 yuan a month but they got on well with the landlord. "He was impressed that we had stable jobs and steady incomes," Song recalls. Because the landlord ran a visa business he was amenable to lowering the monthly rent when Song suggested he might be able to earn additional business through his foreign tenants. He offered two options: paying either 3,400 yuan a month or 3,300 yuan a month. The difference lay with the agent's fee, which at 1,800 yuan was half of the listed rent. At 3,400 yuan, the landlord would cover 600 yuan of the fee and they would be able to spread the cost of the agent's fee over the course of a year. At 3,300 yuan, the fee was 1,800 yuan up front. With that in mind, they opted for the higher rent. Once negotiations were finished, the trio signed the lease a day after the first viewing and Walters had seen and approved of the apartment. 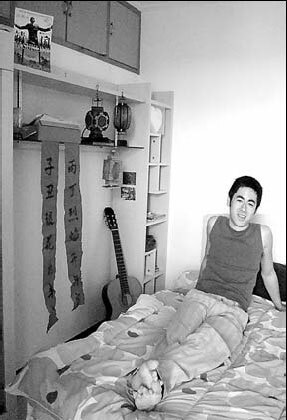 Song took the larger room, paying 1,400 yuan for more natural light and a larger balcony. Oyama got the smaller room, paying 1,000 yuan a month. For 1,000 yuan a month, Walters got the couch in the living room. He didn't mind. "I just felt happier knowing there was always a place for me to stay." One week later in early December, they moved into the apartment. Walters says, "It was pretty quick how it happened. Two weeks before the end of November we made the decision to live together. By December, we had moved in."